Shooting Gallery | BAD'or'RAD Reviews! ‘Do you have what it takes to last through four incredibly intense Shoot ’em up games? A Sharp eye? Steady hand? Split second-timing? 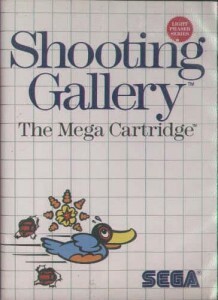 Well pretty much every Master system cover art is just plain horrible, but you do in fact shoot this duck in the game. So it gets a little bit of the box across, and it is telling you what the game is, so it does get some credit. The back of the box says the same thing in a few different languages and has a few screen shots of what you will be shooting in the game with your uncomfortable Light Phaser. Now-a-days, you know.. going backwards in game time, this game is really trying to catch your attention with it’s do you have what it takes exclamation. We will over look that because we all love light gun shooters right? As soon as you start the game, and have your Phaser in hand, you get a screen with letters on it to shoot your initials in. I thought that was pretty cool, for a game this old, even though it doesn’t really save the score. It was still a neat add on. Then you are instantly tossed into level one followed by four more levels if you were a good enough shot. 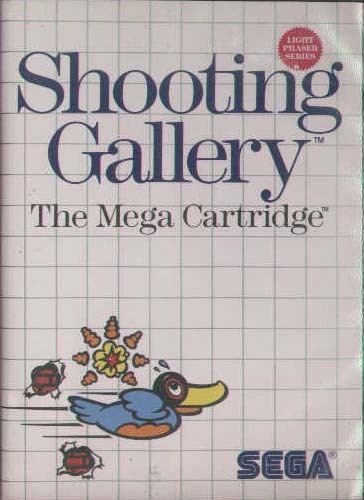 Not too many older games had a lot of different levels to shoot things, (Such as duck hunt) so i enjoyed being able to blast bullets at different things. The game registers shots perfectly and I had a lot of fun playing this. As I said before the game registers all your shots perfectly. I mean it’s always easy when you are too close to the television, but when i was as far back as the wire would let me, it still picked up shots well. This is a straight forward light gun game. There wasn’t any story or anything, but most light gun games really don’t have one. So it lived up to what i knew i was getting into. There’s not too much you can get out of old light gun games except a little nostalgia, but if I was in the mood to just blow away my old scores or my friends, i could probably play this game for quite a long period of time. I loved playing all these light gun games as a child, and i still enjoyed it now, but the lack of more scenes kind of knocked me into a bored state pretty fast. Though if i had someone else at the house playing it with me, i know i would have had a lot more fun sitting down with this game.